The Trump administration says it is changing the way that colleges should handle cases of sexual assault and harassment. 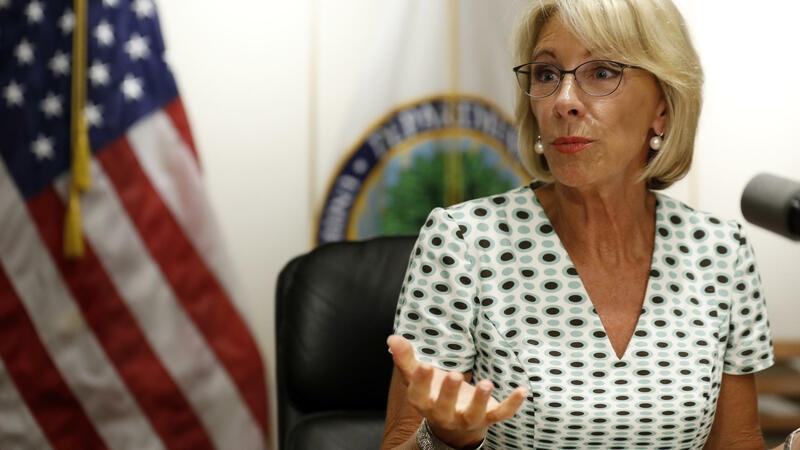 Education Secretary Betsy DeVos is changing rules from President Obama's time. She says the old way was unfair to accused students and others. NPR's Tovia Smith has been following the story. Hi, Tovia. INSKEEP: What's the goal of this change? SMITH: Well, what the secretary has said she wants to do is fix what she calls a failed system, one that's shamefully unfair, she says, to the accused. And this is of course similar to what we've heard from President Trump himself, especially after the Kavanaugh hearings, that guys are being unfairly presumed guilty. So now Secretary DeVos says these new regulations would be historic. They would address due process, in this context, for the first time. And indeed, her changes really do beef up protections for accused students. INSKEEP: I guess we should explain what we're talking about here. This isn't a trial. It's not a criminal proceeding, but colleges may have their own process for dealing with these kinds of allegations, right? SMITH: That's right. And one of the changes that would go into effect if implemented would be that schools could raise the level of evidence that is needed to prove an allegation, making it effectively harder to find someone at fault. Instead of preponderance of evidence, as it was under Obama, it would be clear and convincing evidence. Another big change, cross-examination, which was discouraged under Obama, would be required. This would not be direct, like, student-to-student confrontation. Questions would have to go through a third party. But still, some applaud this as due process. Others say that cross-examining even this way would be re-traumatizing and would discourage other people from filing complaints. INSKEEP: That phraseology is important of course because if it were a criminal trial, you would want proof beyond a reasonable doubt. Preponderance of evidence was seen as something well-short of that. I guess clear and convincing evidence is getting closer to wanting to be beyond a reasonable doubt before you would punish somebody. Is that right? SMITH: A middle ground. But yes, higher standard. INSKEEP: OK. So the regulations also touch on what schools have to investigate. How does that change? SMITH: Well, first off, it narrows the definition of sexual harassment. Instead of any unwelcome conduct, it has to be, quote, "so severe and pervasive and objectively offensive that it gets in the way of a person getting access to education." Also, colleges would only have to investigate accusations that are reported directly to some designated administrators. If not, the school would be off the hook, so to speak. And lastly, the regulations make clear that if a victim doesn't want an investigation, in most cases, the school doesn't have to launch one. INSKEEP: How are people responding to these rules changes? SMITH: Well, on the one hand, those who've been pushing for more due process see it as a big step forward. As one defense attorney told me, he hopes it'll restore sanity to the process. On the other hand, victims advocates are furious. One called the new plan disgraceful. She said it would enable schools to go back to sweeping misconduct under the rug and letting offenders get away with it. INSKEEP: Do universities have to do what the administration just said? SMITH: They absolutely do. These new regulations, if enacted, would have the force of law. But important to note, they don't go into effect until they go through a public comment period, which could be a long process and could result in more changes. INSKEEP: Tovia, thanks for the update - really appreciate it. INSKEEP: That's NPR's Tovia Smith on new regulations announced by the Trump administration on the way colleges should handle cases of sexual assault and harassment.